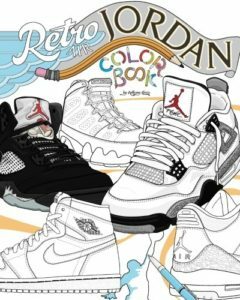 “RETRO AIR JORDAN SHOES” Hours of fun coloring and learning about your favorite Air Jordan shoes from the past or designing the new Air Jordan’s for the future! 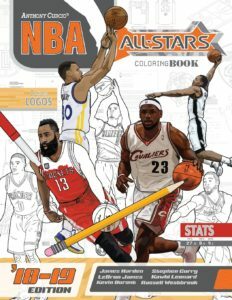 “NBA All Stars 2018-19 Coloring Book” This is the 2018-19 NBA edition of the best selling All Stars series! With more players, more detail, more statistics and more excitement for basketball fans of all ages! Featuring all 30 current team logos, over 40 high quality player illustrations and a new “Design Your Own Team” section. Create your team logo, jerseys, basketball court, shoes, plays and even players! 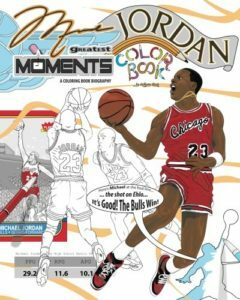 “Michael Jordan’s Greatest Moments” The greatest moments of Michael Jordan’s legendary NBA career told through detailed illustrations, facts, quotes and statistics. This inspiring ‘Coloring Book Biography’ is a guaranteed hit with readers of all ages. 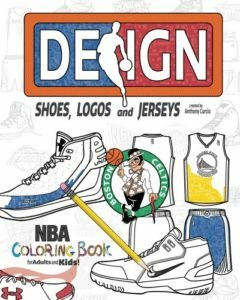 “NBA Design: Shoes, Logos, and Jerseys” Hours of fun coloring your favorite NBA jerseys, logos and player shoes! Full Jersey (front and back) and logos of every team. Over 15 NBA player shoes. 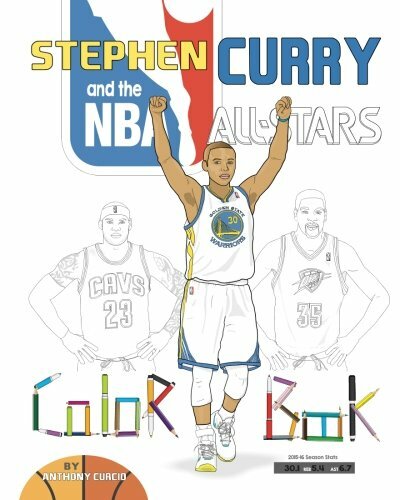 The ultimate coloring book for the creative basketball fan! Design your own jerseys, shoes and so much more! 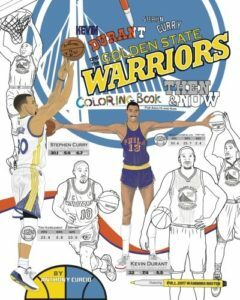 “Kevin Durant, Stephen Curry and the Golden State Warriors” Hours of fun for grown-up’s and kids alike with this Golden State Warriors coloring book full of Warriors stars from past and present. Compare statistics, read player bio’s, learn about former legends, color logos, jerseys and more! 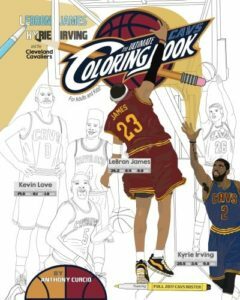 “LeBron James, Kyrie Irving and the Cleveland Cavaliers” Hours of fun for grown-up’s and kids alike with this Cleveland Cavaliers coloring book full of Cavs players from the 2017 season. Compare player statistics, color Cavs logos, design jerseys, shoes and more! 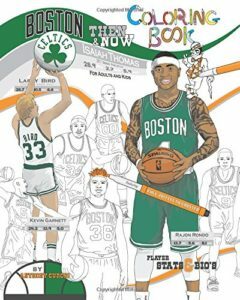 “Isaiah Thomas and the Boston Celtics” Hours of fun for grown-up’s and kids alike with this Boston Celtics coloring and biography book full of Celtics stars from past and present. Compare statistics, read player bio’s, learn about former legends, color logos, jerseys and more! “Stephen Curry and the NBA All-Stars” Hours of fun coloring your favorite NBA stars and team logos. Design your own jerseys, shoes, players and more! 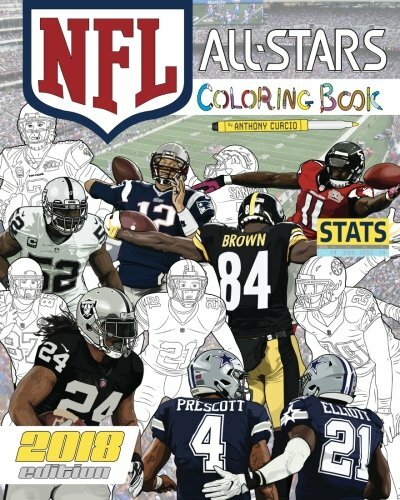 “NFL All-Stars 2018” This is the 2018 edition of the best selling NFL All Stars series! With more players, more detail, more statistics and more excitement for NFL fans of all ages! Over 50 of today’s hottest stars! 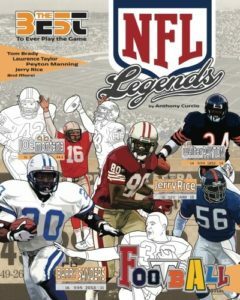 “NFL Legends” Hours of fun for grown-up’s and kids alike with this NFL Legends coloring, activity, and stats book! Evaluate career stats, NFL records and even 40-times! Wondering how today’s stars would match up against an NFL Legend? Use the “Best Season Stats” feature to compare the two – details how to use math to convert player statistics from pre-Super Bowl era (11-12 games) to players from today with 16-game schedules! 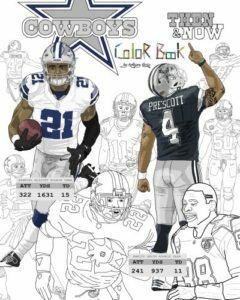 “Ezekiel Elliott and the Dallas Cowboys: Then and Now” Hours of fun for grown-up’s and kids alike with this Dallas Cowboys coloring book full of Cowboys stars from past and present. Compare player statistics, create and learn about plays, design logos, helmets, uniforms and more! 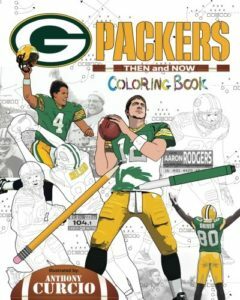 “Aaron Rodgers and the Green Bay Packers: Then and Now” Hours of fun for grown-up’s and kids alike with this Green Bay Packers coloring book full of Packers stars from past and present. Compare player statistics, create and learn about plays, design logos, helmets, uniforms and more! 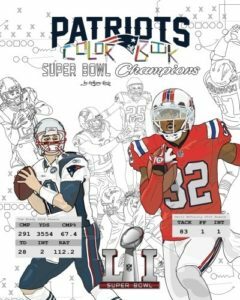 “New England Patriots 2017 Super Bowl Champions” Celebrate the greatest comeback in Super Bowl history with this detailed 2017 Patriots LI Super Bowl Champions coloring book loaded with star players from the 2016-2017 season. Includes stats and bio’s about each player and 4 Patriots Legends from the past! Also features an exciting and creative ‘design your own’ jersey’s, uniforms and plays section and much more! 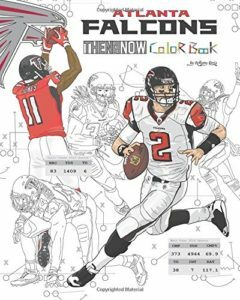 “Matt Ryan and the Atlanta Falcons: Then and Now” Hours of fun for grown-up’s and kids alike with this detailed Atlanta Falcons coloring book full of Falcons stars from past and present. Read player bio’s, compare statistics, create and learn about plays, design logos, helmets, uniforms and more! 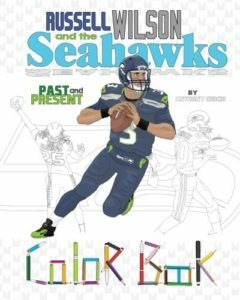 “Russell Wilson and the Seattle Seahawks: Then and Now” Hours of fun for grown-up’s and kids alike with this detailed Seahawks coloring book full of Seattle stars from past and present. Player statistics, an exciting and creative ‘design your own’ logo, helmet and uniform section and much more! 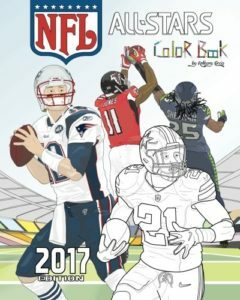 “NFL All Stars 2017” Hours of fun coloring your favorite NFL stars and team logos. Create your own plays, design your own jerseys, cleats and more! 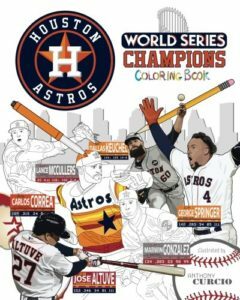 “Houston Astros World Series Champions” Hours of fun for grown-up’s and kids alike with this Houston Astros: 2017 World Series Champions Coloring Book full of Astros stars from past and present. Compare player statistics, color Astros players, logos, hats, full uniforms and more! Also includes a ‘design-your-own’ section with detailed custom templates to create the Astros 2018 style! 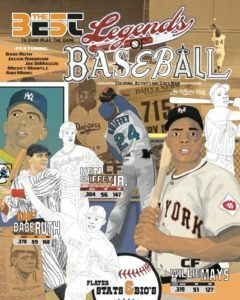 “Legends of Baseball” : Coloring, Activity and Stats Book for Adults and Kids: featuring: Babe Ruth, Jackie Robinson, Joe DiMaggio, Mickey Mantle and more! (35 BEST BIOGRAPHY Series) Hours of fun for grown-up’s and kids alike with this Legends of Baseball coloring, activity, and biography book! Compare season and career stats, learn about where they grew up, the awards they won and how they became one of the 35 greatest players in baseball history! 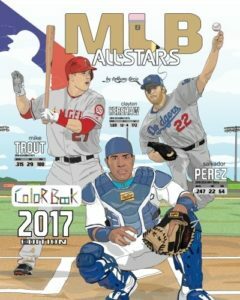 “MLB Baseball 2017 All Stars” Hours of fun coloring your favorite MLB stars and team logos. Compare player statistics, design your own jerseys, cleats and more! 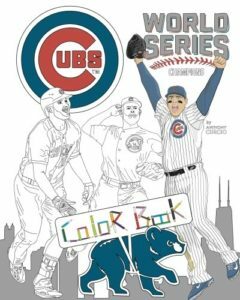 “Chicago Cubs World Series Champions” Hours of fun for grown-up’s and kids alike with this detailed Chicago Cubs World Series Champions coloring book loaded with star players from the 2016 season. Also featuring an exciting and creative ‘design your own’ field, hat and uniform section and much more! 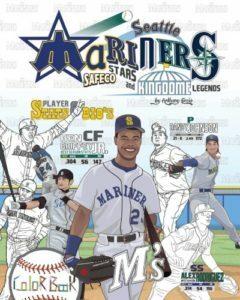 “Seattle Mariners Coloring Book” Hours of fun for grown-up’s and kids alike with this detailed Mariners coloring book full of Seattle stars from past and present. Player statistics, an exciting and creative ‘design your own’ jersey, hats and cleats section and much more! 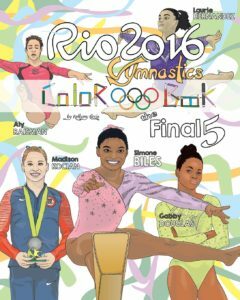 “Rio 2016 Final Five Gymnastics Coloring Book” Hours of fun coloring the US Women’s Gymnastic Team “The Final Five” from the 2016 Olympics in Rio. 60 highly detailed pictures of Simone Biles, Aly Raisman, Gabby Douglas, Madison Kocian and Laurie Hernandez! Also includes gymnast bio, a design your own Leotard section and much more! 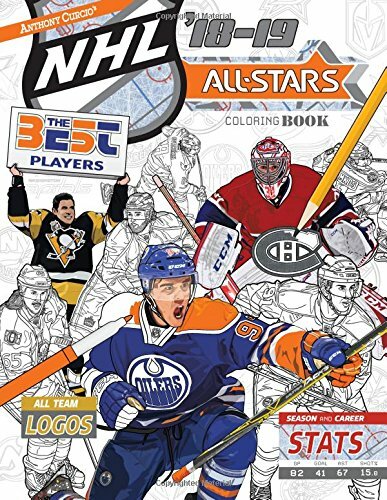 “2018-19 NHL Hockey All Stars” This is the 2018-19 NHL edition of the best selling All Stars series! With more players, more detail, more statistics and more excitement for hockey fans of all ages! Featuring all 31 current team logos, 30 high quality player illustrations and 6 NHL Legends! 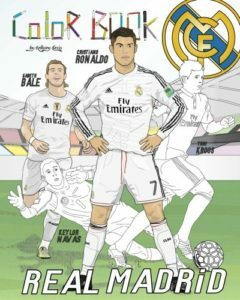 “Cristiano Ronaldo, Gareth Bale and Real Madrid”: Soccer (Futbol) Coloring Book. Hours of fun coloring your favorite Real Madrid Soccer (futbol) stars and team logos. Create your own players, design your own uniforms, cleats and more! The ultimate book for soccer fans of all ages! “Messi, Neymar, Suarez and F.C. 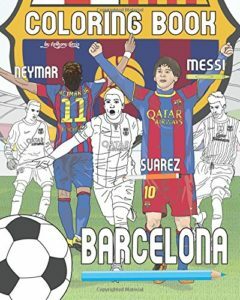 Barcelona” Hours of fun coloring your favorite Barcelona Soccer (futbol) stars and team logos. Create your own players, design your own uniforms, cleats and more! The ultimate book for soccer fans of all ages! 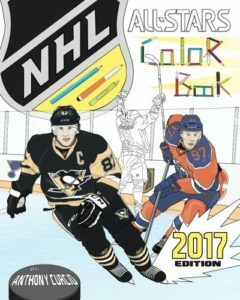 “2017 NHL All-Stars Hockey Coloring Book” Hours of fun coloring your favorite NHL stars and team logos. Create your own players, design your own uniforms, skates and more! The ultimate book for Hockey fans of all ages! 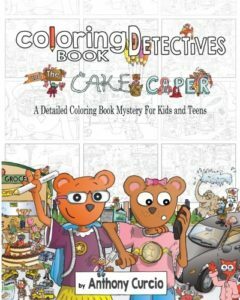 “The Coloring Book Detectives” is a one of a kind, detailed, new style of coloring book mystery that requires readers to search for every last clue in order to solve an elaborate cake heist pulled off by some unlikely bandits. The illustrator is along for a wild ride full of twists and turns, stakeouts, interrogations, evidence gathering and learning all about how law enforcement works to solve real world cases.